Successful application and maintenance of frequency inverter requires an understanding of their impact on the motor and electrical distribution system. The ability of a motor to cool itself effectively is reduced as the motor is slowed down. Over-sizing the motor or providing external forced air ventilation may be required with extended operation at low speeds and high loads. Operation at different speeds can cause mechanical resonances in driven equipment. These speeds should be identified and programmed out of the motor's operating range. frequency inverters generate harmonic voltages and currents which can, in some cases, cause undesirable effects on the electrical distribution system and affect equipment operation. If a power quality problem is suspected, the electrical system should be examined by a qualified person. Sometimes isolation transformers, line reactors or filtering devices will be required to minimize these effects. Contact your local electrical utility representative for more information. Installation of filtering devices should be considered at the time of purchase of frequency inverters to minimize power quality issues in the electrical system. A practitioner trained in this area should be used to evaluate and determine this requirement. Microprocessors, numerically controlled machines, and process controllers all rely on accurate control signals. The presence of harmonics can cause these devices to malfunction. Harmonics can also cause interference with computers and improper operation of electronic equipment. They can also cause capacitor and fuse failure. Motors run at higher temperatures in the presence of harmonic currents. Motors consume more energy as they have to overcome 'counter rotating' torques created by odd harmonics. This may cause premature breakdown of insulating materials and a reduction in life. The motor will also drop in overall efficiency, experience voltage stresses on its windings and experience torque pulsations. If a harmonic problem is suspected, it should be confirmed before any attempt at corrective action is taken. 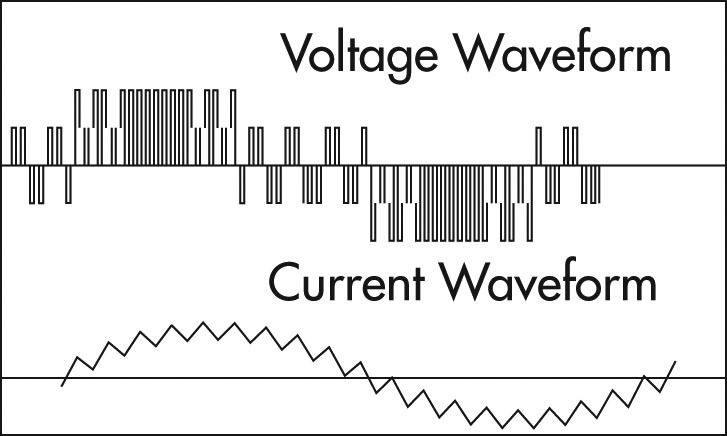 A fairly simple test consists of viewing the power system waveforms on an oscilloscope. Significant waveform distortion is an indication of harmonic presence. Power harmonic analyzers can be used to measure the magnitude of the individual harmonics. This work is often best left to an expert in power quality services. Ideally, loads producing harmonics, and sensitive loads, should be supplied from entirely separate feeders and independent transformers. Isolation transformers and line reactors are frequently used to protect the inverter as well as the AC line from distortion. Harmonic filters can be used to reduce the amplitude of one or more fixed frequency currents to prevent them from entering the rest of the system. Filters can be custom designed to suit the electrical environment. Cable length should be kept as short as possible, i.e., less than 15 meters or 50 feet, wherever possible. As a general rule of thumb, it is considered good practice to buy a complete inverter system that includes line reactors rather than just purchasing the inverter on its own. Generally a 3% to 5% impedance line reactor will prevent harmonics generated by a frequency inverter from interfering with sensitive equipment on the distribution system. If non-linear loads exceed 20% of the total plant load, special consideration should be given to performing a harmonic study and minimizing potential harmonic impact through the use of isolation transformers in addition to line reactors. Inverter specifications often cite "The power conditioning equipment shall not produce voltage distortion or notches in excess of the limits suggested in IEEE 519", but it may be unclear what this means for a particular installation. What does meeting IEEE 519 mean when installing an inverter on a power system? IEEE's Recommended Practices and Requirements for Harmonic Control in Electric Power Systems, IEEE Std 519-1992, is often referenced but may not be well understood. IEEE 519-1992 contains sections on problems caused by harmonic currents and voltages, calculation examples, application examples, and the harmonic currents caused by different types of power converters and non-linear loads. From a practical inverter application point of view, meeting harmonic requirements for inverters means having less than 5% total harmonic distortion of the current at the terminals of the inverter at rated load. At low power demand with variable torque loads, the current's total harmonic distortion (THD) may be higher than 5% as measured by a harmonic analyzer, but the magnitude of the harmonic current will be less than those produced at full load. Winding insulation systems are classified by their temperature or thermal capabilities. Tests used to prove thermal properties for low voltage systems do not stress the electrical insulation beyond 600 volts. Application of a PWM frequency inverter can cause voltage transients well above the rated voltage of the motor which can lead to failure of the insulation system in a very short period of time. 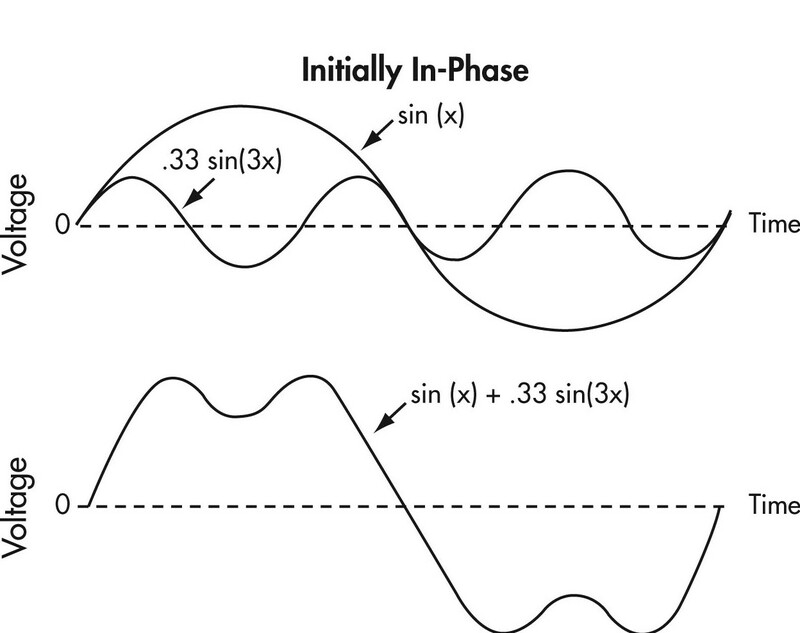 To understand this, consider the way in which a PWM inverter approximates a sinusoidal current waveform. The following figures show typical voltage and current waveforms for Pulse Width Modulation inverters. The voltage waveform is made up of a series of pulses controlled by the inverters output devices. The width or duration of these pulses is controlled to approximate a sinusoidal current waveform. 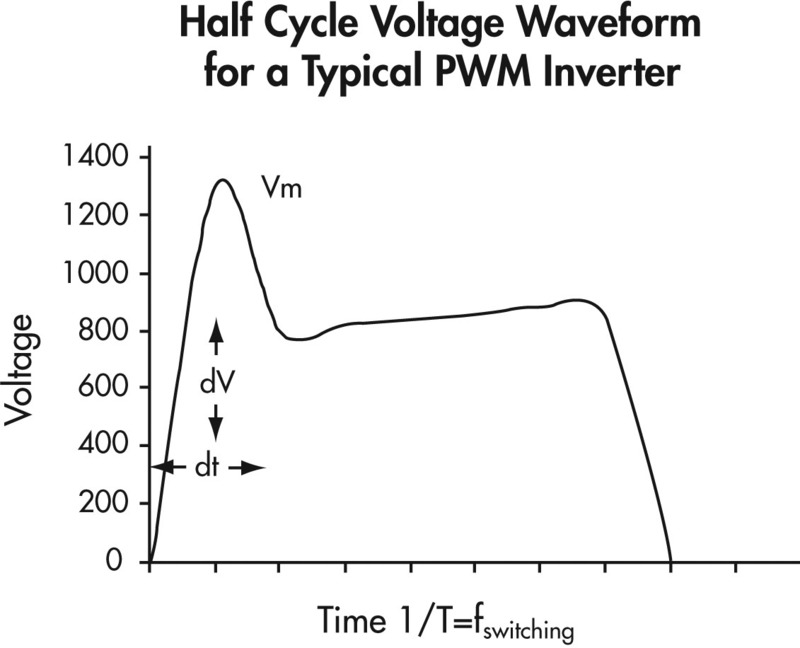 Figure 9 is a half cycle voltage waveform for a typical PWM inverter operating on a 600 volt system. The maximum voltage stress on the insulation system (Vm) can be significantly higher than the motor's rated voltage and have extremely fast voltage rise times (shown in Figure 9). Due to multiple reflections or resonance effects, the frequency can increase due to the interactions of the PWM switching frequency and waveshape, the cable length supplying the motor, and the inductance of the motor. A voltage reflection of up to two times the applied voltage can occur due to standing waves or a "ringing effect", and becomes more problematic with longer cable runs (typically greater than 15 m or 50 feet). A "ringing effect" creates very high voltage stresses across the first few turns of the motor windings, and can result in interim short-circuits and ground wall insulation failure. This problem can be minimized by using appropriate filtering, using motors with improved insulation systems (inverter duty motors) and ensuring that repaired motors have upgraded insulation systems. Many frequency inverters provide for user adjustment of the switching frequency. This frequency can be adjusted over a range as broad as 500 Hz to 20 kHz. The choice of switching frequency can be significant because it defines the number of voltage overshoots occurring at the motor in a certain amount of time. Higher switching frequencies will result in higher numbers of overshoots and higher magnitudes, which will stress the motor's insulation system. If the motor's peak voltage rating is higher than the level of the overshoot, high switching frequency should not be a problem. If, however, the overshoot levels are higher than the peak voltage rating of the motor, the use of a lower switching frequency may reduce the overshoot levels below the peak voltage rating of the motor. However, too low a frequency may cause an audible noise from the motor which may be undesirable in some applications such as HVAC systems. maintaining the original winding design when rewinding motors since reducing turns increases inter-turn voltage levels. Thermal considerations of motor operation with a frequency inverter should be one of the first areas of attention for successful application. As the motor speed is reduced, the amount of cooling available from the motor's ventilation system is reduced, so motor torque must be limited at reduced speed to avoid overheating. In addition to the reduced cooling capability, motors have additional internal heating due to the non-sinusoidal voltages and currents from the inverter operation. The application of a frequency inverter to a variable torque load such as a fan or centrifugal pump does not usually present problems, but constant torque or constant horsepower loads can cause motor overheating at reduced speeds because there is less air flow over the motor. It should be noted that many applications where a DC motor has been replaced by an AC induction motor with an inverter are of the constant torque or constant horsepower class. 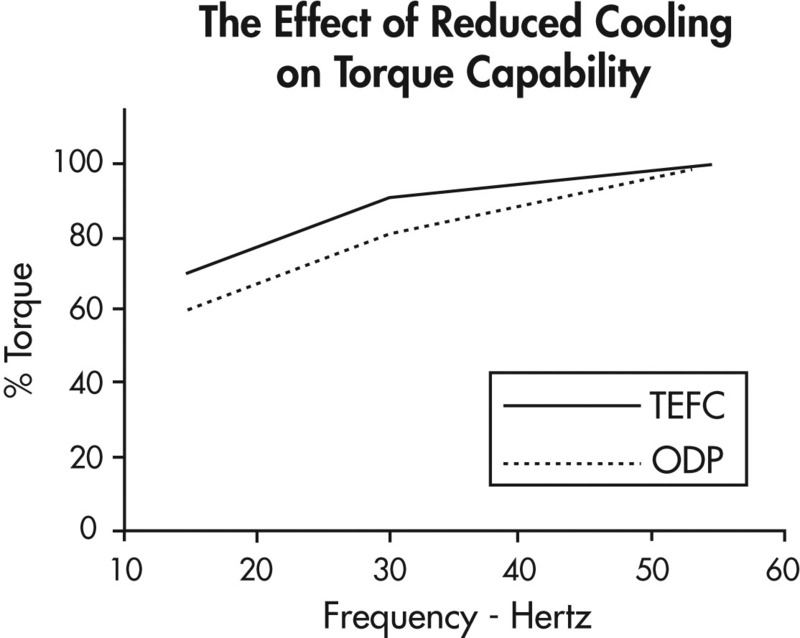 Figure 10 shows the allowable torque of NEMA design A&B motors due to reduced cooling from operating at reduced speeds. It can be used as a guide for de-rating motors or selecting an appropriately oversized motor. The use of a motor with a 1.15 service factor and class F insulation is generally recommended to allow for additional heating due to harmonics. The ability of a motor to cool itself effectively is reduced as the motor is slowed down. Oversizing the motor or providing external forced air ventilation may be required with extended operation at low speeds and high loads. "Inverter duty" motors are designed for optimized performance when operated with frequency inverters. These motors typically have better insulation systems and can also be forced ventilated with auxiliary blowers available as an option. This allows them to run cooler rather than having to oversize them when running high torque loads. When applying a PWM inverter it is important to check for shaft currents on motors with frequent or unusual bearing failures. Shaft currents are not normally a problem with motors less than 20″ in core diameter, but can become a problem with high frequency harmonics associated with inverter use. Shaft voltages exceeding 0.3-0.5 volts may indicate potential trouble and may require shaft grounding or insulating the non-drive bearing. Frequency inverters must be selected to ensure that they have adequate protection from their environmental conditions. frequency inverters are usually mounted into an electrical enclosure with other electrical devices, or as a standalone unit in its own enclosure. Type 1 — Enclosures constructed for indoor use to provide a degree of protection to personnel against access to hazardous parts and to provide a degree of protection for the equipment inside the enclosure against ingress of solid foreign objects (falling dirt). Type 2 — Enclosures constructed for indoor use to provide a degree of protection to personnel against access to hazardous parts, to provide a degree of protection of the equipment inside the enclosure against the ingress of solid foreign objects (falling dirt) and to provide a degree of protection with respect to harmful effects on the equipment due to the ingress of water (dripping and light splashing). Type 3 — Enclosures constructed for either indoor or outdoor use to provide a degree of protection to personnel against access to hazardous parts, to provide a degree of protection of the equipment inside the enclosure against ingress of solid foreign objects (falling dirt and windblown dust), to provide a degree of protection with respect to harmful effects on the equipment due to the ingress of water (rain, sleet, snow) and that will be undamaged by the external formation of ice on the enclosure. Type 4X — Enclosures constructed for either indoor or outdoor use to provide a degree of protection to personnel against access to hazardous parts, to provide a degree of protection of the equipment inside the enclosure against ingress of solid foreign objects (windblown dust), to provide a degree of protection with respect to harmful effects on the equipment due to the ingress of water (rain, sleet, snow, splashing water, and hose directed water), that provide an additional level of protection against corrosion and that will be undamaged by the external formation of ice on the enclosure. Exposure to an ambient temperature in the range of 15°C to 40°C. Exposure to an altitude which does not exceed 3300 feet (1000 meters). Installation on a rigid mounting surface. Installation in areas or supplementary enclosures which do not seriously interfere with the ventilation of the inverter. There is a general assumption that slowing down rotating equipment leads to less wear and tear and hence promotes better maintenance conditions. Frequently, equipment life can be extended through the benefits of variable speed. However, there are a number of detrimental mechanical conditions that can arise when equipment is slowed down. Most machines are designed to operate at a speed which is selected at a calculated safe margin below the first critical speed or natural frequency of the shaft. In certain cases, to facilitate shaft design, some high speed machines are designed to operate between the first and second critical speeds. A speed reduction for a machine of this type could result in operation at the first critical speed. For larger installations, contact should be made with the inverter manufacturer to ensure that the critical speeds are known and dealt with appropriately. Resolving vibration and resonance usually involves programming the frequency inverter so that it will not operate equipment in the critical speed range. If the design data cannot be located, field tests should be performed or the complete apparatus should be measured and the critical speeds recalculated.